Scientists Are The New Kings (Or At Least Secretaries) At Energy Department : It's All Politics It might seem like a no-brainer to have an individual with a strong science background at the helm of a federal department that oversees a lot of complex science projects, like maintaining the nation's nuclear weapons labs. But Washington isn't a city that necessarily does no-brainers well. Massachusetts Institute of Technology scientist Ernest Moniz is introduced by President Obama as the nominee to run the Energy Department, Monday at the White House. With President Obama nominating Ernest Moniz to be the nation's next energy secretary, he continued a relatively recent trend of putting scientists atop a part of the federal bureaucracy once overseen by political types. 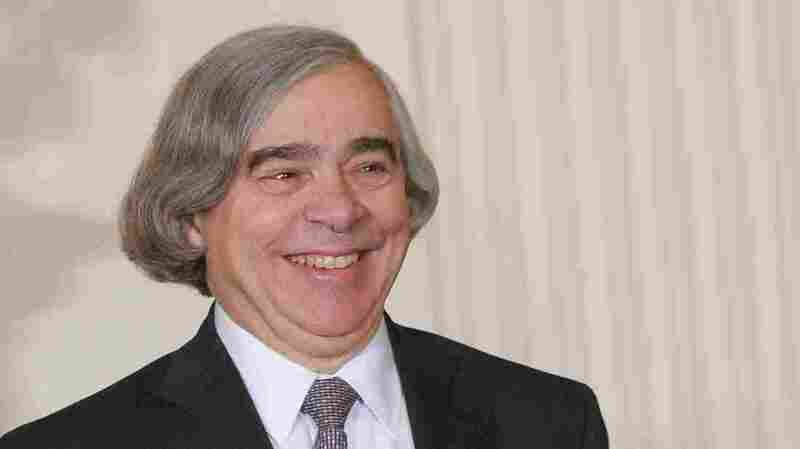 If confirmed by the Senate, Moniz, an MIT physicist, will follow Nobel laureate Steven Chu, a University of California physicist who served as Obama's first-term energy secretary. And Chu came after President George W. Bush appointee Samuel Bodman, who was no slacker in the field of science, either. He held a doctorate in chemical engineering from the Massachusetts Institute of Technology, where he also taught as an associate professor. All right, it might be a stretch to include Bodman, since by the time Bush named him to the Energy Department post, he had long before traded academia for big gigs in corporate America. Still, he did have that engineering doctorate. It might seem like a no-brainer to have an individual with a strong science background at the helm of a federal department that oversees a lot of complex science projects, like maintaining the nation's nuclear weapons labs and researching new energy technologies. But Washington isn't a city that necessarily does no-brainers well. Which helps explain the heavy dose of political figures — a former senator (under President George W. Bush); a former governor (under President Reagan); a former House member (under President Clinton); a former big-city mayor (also under Clinton) — who dominate a list of previous energy secretaries, a list that also includes lawyers, businessmen and a retired admiral. Obama has clearly broken away from the pattern by naming two highly regarded scientists to lead a department that in the past has had a reputation for dysfunction. And some might be inclined to give George W. Bush credit for, at the very least, naming a secretary with a STEM doctorate. Of course, Obama's choices at Energy can be read as something of a rebuke to that same Bush, whose officials were known to question scientific consensus, such as humans contributing to climate change. Obama has repeatedly promised to "restore science to its rightful place." If it's a trend, it may be too soon to know if it will take hold. "That's actually a good thing. We like politicals. For whatever reason, Energy is breaking out of it. That's terrific. It sets a higher bar, and maybe we'll get that in other key posts. It is an interesting trend, I'll give you that one."